You are here: Home / Just For Fun / Win Your Dog’s Dinner! 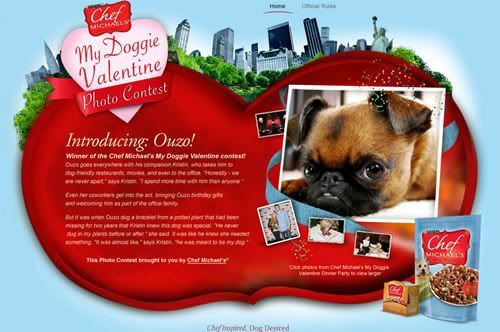 Above: Ouzo was the winner of the Doggie Valentine Contest held in New York earlier this year. We were in the midst of an epic snowstorm when I got invited to Purina® Chef Michael’s Be My Valentine Doggie Dinner Party in New York City. Although I wasn’t able to make it, my loss is your gain since Purina® has agreed to give me three Doggie Dinner Kits to award to three of my subscriber winners (sign up below now so you can participate). When I wrote Blessing of the Animals, I did not include a specific section on Valentine’s Day because I know pet lovers celebrate their pets each and every day. 26% say “I love you” once every day to their dogs. Would it surprise you to learn that the 26% is the same percentage that say, “I love you” to a spouse or significant other on a daily basis? Anyway, the Chef Michael’s Be My Valentine Doggie Dinner Party took place at Gotham Hall and was a star studded affair. Elisabeth Rohm, herself a dog owner (and current star of Heroes), teamed up with Purina® Chef Michael’s™ to celebrate along with a long list of celebrities. There was a contest too but I was more glad to hear that this doggie valentine event had a larger mission. For every valid entry, Chef Michael’s donated $10 to Adopt-a-Pet.com (up to $7,500) to support its mission to find forever homes for homeless dogs. 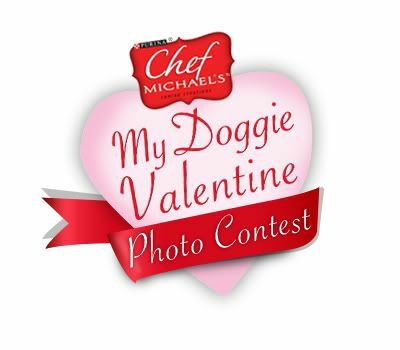 As for you, well if you want to win a Purina® Chef Michael’s Doggie Dinner Kit, subscribe and send me a note about how you make every day a Valentine’s Day for your pet. Three subscriber participants were awarded a Purina® Chef Michael’s Doggie Dinner Kit and were announced in the March 2010 Ark Animal Tracks newsletter. What? You are not a subscriber yet? You missed this contest but sign up to the newsletter using the form on the upper right side of the page so you don’t miss any others!